LEXINGTON, Ky. (AP) — Kash Daniel could handle stepping on Kentucky’s practice field knowing some familiar and formidable faces on defense wouldn’t be there. The Wildcats‘ initial team meeting this spring was another matter. Gone were pass-rushing standout Josh Allen and seven other starters who had moved on from a stingy unit on which Daniel, a middle linebacker, also played a pivotal role. Kentucky will have a high bar to reach defensively in replacing eight starters from a 10-3 squad that beat Penn State 27-24 in the Citrus Bowl on New Year’s Day. The Wildcats will also have a new defensive coordinator in Brad White, who was elevated from outside linebackers under predecessor Matt House. The Wildcats allowed 337.4 yards per game last year to rank 23rd nationally and yielded an average of just 16.8 points, which ranked sixth. Leading the way was Allen, the Southeastern Conference defensive player of the year and consensus All-America who also collected the Chuck Bednarik, Bronko Nagurski and Ronnie Lott awards as the nation’s top defender. 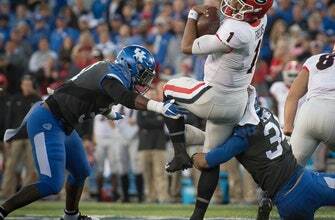 He departed as Kentucky’s record holder for sacks in a season (17) and career (31.5) and will likely be one of the first players chosen at the NFL draft on April 25. Several defensive teammates could also be selected that weekend, including linebacker Jordan Jones, safety Mike Edwards and cornerbacks Chris Westry and Derrick Baity Jr. While their departures left large voids to fill, Wildcat players see an opportunity to prove what they learned as their backups. They also acknowledge having a tough act to follow. White’s promotion after one season in Lexington helps maintain continuity. After all, White helped Allen blossom into the nation’s most dominant pass rusher last season. Watson (five sacks) showed promise while Daniel was a strong anchor in the middle. The intensity shown so far this spring has the coordinator and players confident of continuing that success this fall, even if it’s less flashy than 2018. “I’m just sort of carrying the torch, so I don’t think there’s a huge philosophy change,” said White, a former NFL assistant, who took over in February after House left for the Kansas City Chiefs. Friday night’s Blue-White scrimmage presents challenges for Kentucky on both sides of the ball. But the defense will draw attention, if only to show how it plays together with new faces in key places. And some good ones, Stoops noted. “We have some areas where we have strengths and we have some experience,” he said, “and then we have some different areas where we’re really young and really inexperienced. Kentucky opens the season against Toledo on Aug. 31.